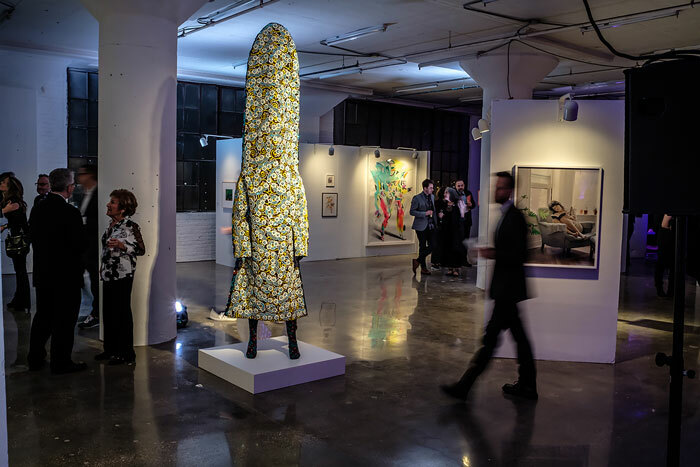 CHICAGO–The School of the Art Institute of Chicago (SAIC), a global leader in art and design education, raised more than $615,000 at its first faculty and alumni art auction and benefit. Proceeds from the auction contribute to Beautiful/Work: The Campaign for SAIC, an initiative to raise $50 million for increased scholarship opportunities, faculty support, and programming. Other notable purchases included Untitled Anxious Drawing, 2017, a work by Rashid Johnson which was auctioned live at the event and fetched $17,000 and works by Sterling Ruby, Rashid Johnson, and LaToya Ruby Frazier. For those still looking to participate in this fundraising event, select works are available, and inquiries can be directed to SAIC via Janelle Beaird, jbeaird@saic.edu. Since the start of the public phase of the Beautiful/Work campaign, more than 75 percent of current and incoming students have received scholarship support, and for the fiscal year 2016–17, the School awarded a record number of scholarships totaling approximately $42 million. More than 1,800 individual donors have made contributions, and alumni have donated a record $11 million, a significant increase over alumni giving prior to the campaign. Established more than 30 new endowment scholarship funds that support undergraduate and graduate students, including eight merit scholarships that cover the full cost of tuition for graduate students. Established seven faculty support endowments, including four full professorships, one directorship, and two part-time faculty awards. Supported nearly 90 Chicago Public High School students through scholarships and financial assistance from the Walter and Shirley Massey Chicago Scholarship Fund, SAIC’s College Arts Access Program, and SAIC’s Bank of America Scholars program. SAIC has 1,400 faculty and staff and more than 3,600 undergraduate and graduate students. Alumni have artwork in museum collections throughout the world; work in communities as organizers and advocates; have designed remarkable objects, images and systems; and are scientists, scholars, mentors and cultural workers. For the latest news on the campaign or to support Beautiful/Work: The Campaign for SAIC, visit campaign.saic.edu. Watch this video to learn more about the impact of giving. For more than 150 years, the School of the Art Institute of Chicago (SAIC) has been a leader in educating the world’s most influential artists, designers and scholars. Located in downtown Chicago with a fine arts graduate program consistently ranking among the top programs in the nation by U.S. News and World Report, SAIC provides an interdisciplinary approach to art and design as well as world-class resources, including the Art Institute of Chicago museum, on-campus galleries and state-of-the-art facilities. SAIC’s undergraduate, graduate and post-baccalaureate students have the freedom to take risks and create the bold ideas that transform Chicago and the world—as seen through notable alumni and faculty such as Michelle Grabner, David Sedaris, Elizabeth Murray, Richard Hunt, Georgia O’Keeffe, Cynthia Rowley, Nick Cave, Jeff Koons, and LeRoy Neiman. SAIC's Beautiful Night Auction Raises More than $615,000. Image: Emilio Albertini for the School of the Art Institute of Chicago.